I take framing one step further and talk about the power of numbers in today’s episode. This behavioral economics podcast will be a break from our foundation episodes. I get in to some of my most frequently asked questions (including ending prices in 99 or 97). 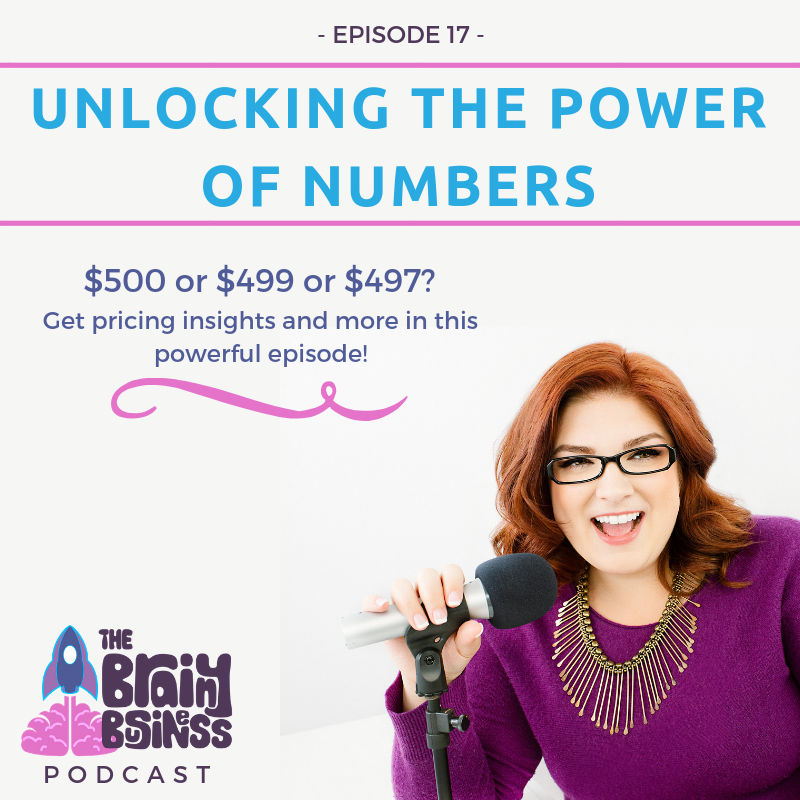 I also talk about pricing strategies like using random or “interesting” numbers. I share research, examples, and how you can apply framing using numbers in your business. Before I dig in, I want to thank Justin from 52 Card Media, Jesse from Cinematic Syndicate, and Jennifer of Jennifer Findlay Portraits for making the website look so awesome. I have also transitioned to a new YouTube Channel and all the full episodes of this podcast are on it. Feel free to subscribe and share it with your friends. [09:17] Last week was all about the concept of framing. Today, we take that concept one step further by unlocking the power of numbers in your business. [09:45] The way you say something is often more important than what you’re actually saying. This ties back to loss aversion (which was the focus of episode 9) – remember framing something as a loss makes people twice as likely to take action than when it is framed as a gain. [11:21] I talked a little bit about pricing and Episode 5. All of the things leading up to the price matter more than the number itself. [12:16] Is it really better to end something in 99 than rounding up to the nearest dollar? Should my prices end in 99 or 97? Should I have a random, but interesting number like 456.78? [12:55] It’s (generally) better to round down in the 99 versus one dollar question. This works because you’re bringing down the first whole digit number. 599 looks better than 600. [14:24] Consistency is key. If you list your prices and have them one on top of the next, and they say, 399, 499, 999 and 2500 it is just weird. [16:27] The great debate of 99 versus 97 (or even 95). Any of them are typically better than the rounded 0 because of the first digit difference. [19:09] Making someone stop and say “what?” can be good if you’re trying to disrupt the buying cycle. [20:50] Journal of Consumer Research study called “This Number Just Feels Right” states that luxury pricing or other things bought on emotion (like a bottle of champagne) sold better when it was priced at $40.00 instead of $39.72 or $40.28. [22:01] In another study on the pricing of a camera, participants favored the rounded prices (leisure/luxury/emotional purchase) and the non-rounded prices when they thought it was for a class project (function or looking for a deal). [22:32] Bringing it back to FRAMING: the mindset that someone is in when they are going to buy from you matters. [23:26] Confidence helps you sell and encourages people to buy. [24:08] Statistics and numbers can be very persuasive when presented properly. They can also be negatively persuasive when presented wrong. [25:16] Numbers help your brain value things and make comparisons. Which helps it to make a decision without flagging your conscious brain. [26:22] Look for numbers in your business. People like to be part of the group and that is a big reason why framing in numbers matters. [27:51] We make assumptions based on the numbers we see. [28:49] Statistics like this work because people want to be like everyone else. [29:39] To know what works best, you need to try different types of numbers. [30:18] Four out of five has a better context in the brain than 78%. [32:24] “Most” sounds better than 50%. You can also try to flip the framing the other way. [33:42] Find a number in your business and look at all the different ways to present it. Let me know what works best for you. [40:30] Episode 18, is back to behavioral economics foundations – when we will talk about priming. You won’t want to miss it! BE thoughtful. Thank you my friend! And, agreed! I am so glad I chose to invest and work with you!